We provide a four point treatment to maintain your lawn all year round. 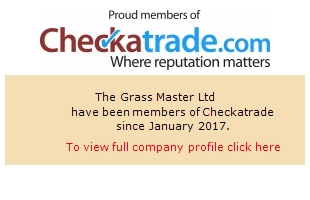 We treat your lawn seasonally and you simply pay as you go with no contract to sign and no obligation. The fertilisers, weed killers and moss control treatments are applied at the right time and in the right quantities. We offer a professional service using professional products that are not available to the general public. In fact, our service will actually cost you less than if you were to do it yourself! 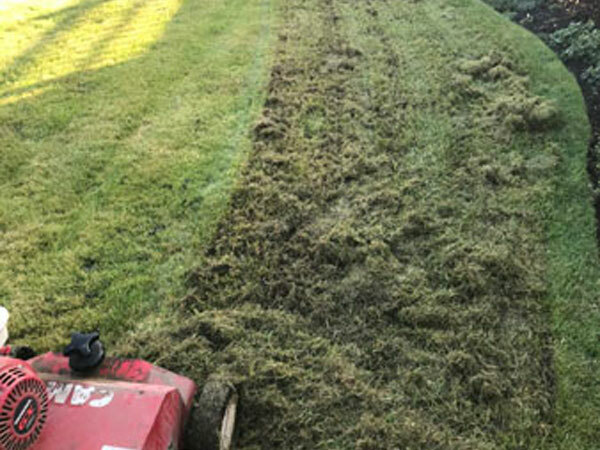 Scarification is the mechanical process of removing surface thatch from your lawn. 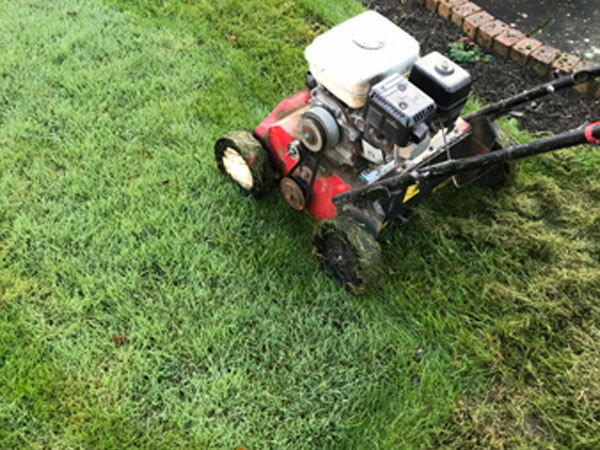 It is a rigorous operation and we remove a large amount of matter from the lawn which thins out the grass and promotes new growth. We will then bag this up for you to dispose of. The blades of the scarifier penetrate the surface by 2-3mm lifting out the matted thatch. We tend to carry out this process out of season when the grass is not actively growing, so as not to hinder new growth. 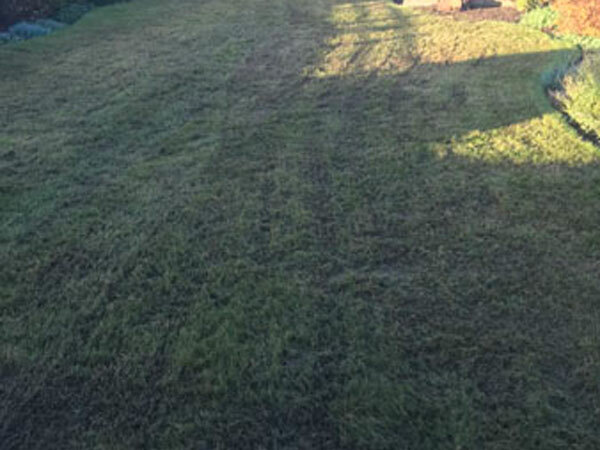 After Scarifying the lawn can look unsightly for a couple of weeks so we carry out this process at a time when you are less likely to be using your lawn. Lawns will recover quickly. We would recommend Scarification annually. 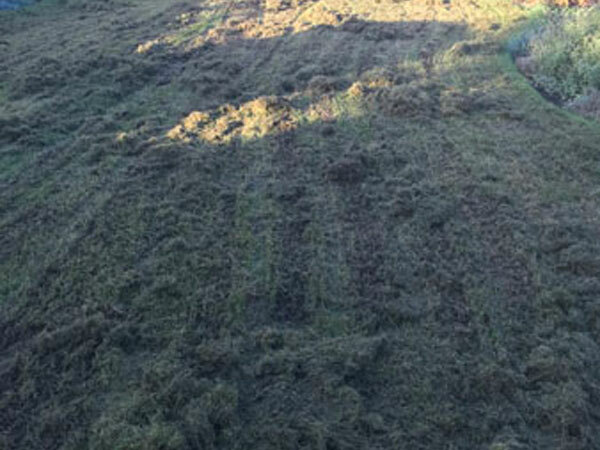 When aerating, we remove thousands of cores from your lawn using specialist machinery. The cores are 3'(75mm) long and ½'(12mm) wide. The holes left will close up themselves throughout the winter months thus relieving compaction. This promotes deep root growth and strengthens your lawn ready for the next season. The cores are left on your lawn and usually take a few weeks to break down and act as a top dressing for your lawn. If you wish you can rake or mow them once they have dried sufficiently. We recommend that aeration is carried out annually to allow your lawn to breath and to keep it healthy.